I haven't weighed in on this subject, but it deserves a look-see. I have discussion some "Common Core" educational system, and it is horrendous. Check some youtubes and educate yourself. It is important to understand. for first time ever one or two years ago I saw a child's homework based on core curriculum and my immediate response was: "What is that? It makes no sense, how dumb is that"
It was so convoluted. far reach from what used to work just fine and which used to produce world class educated people. Is core curriculum a weapon?! Gotta wonder. Maybe not a weopon, but a tool that doesnt play to the publics interest. when I was a child in California schools we had excellent, perhaps even world class, education (@ 1965 onward). Why change what works? Because a good slave class must imagine themselves to be free and to have critical thinking skills. Emphasis on the imagine. They will probably be "proud" of their "free thinking", counting cows instead of that nasty "stacking" arithmetic. Just found this site from a comment on zerohedge and saw this post. I read this whole book cover to cover probably more than 10 years ago. The read is a hard slog, but well worth it. 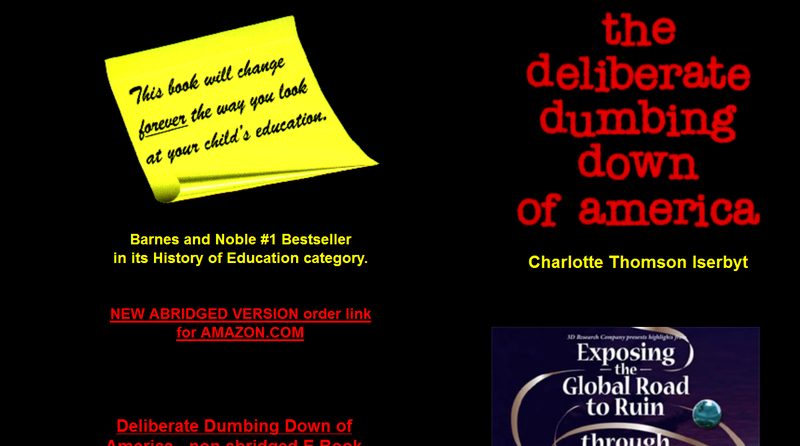 You can read all about how modern education is being molded by someone named 'DK'. And- get ready for a surprise- DK is Dwaj Khul a disembodied spirit from Tibet. Thanks NEA. That is just one little bit. There is so much insanity in that book- all direct quotes from Dept of Education and places like that. TY for the comments, maybe I will buy it, $26 used on Amazon seems high. I watched a few videos on common core, it is horrific.